Prayer To The GOP God! It's me, Jillian. Hope you are listening, because I need for You to hear me. I know that I have sinned. I know that as a woman, I am not smart enough to make decisions about my health care or my body. I can spell 'uterus', but am certainly not intelligent enough to know what a uterus is. I have a uterus, but I am not sure what it is designed to do. I have other female body parts, but am not capable of determining how to best care for those parts. I do know what cancer is, dearest GOP God. I know You are aware that breast cancer killed my mother when she was only 56 years old. Her death tore a hole in my heart that has never been filled, but beyond that, I guess I don't know anything about women's cancer, heart disease, high blood pressure, diabetes or even strokes. I know what birth control is, but You obviously know more. I know that a woman's right to choose is Satan's flawed idea and demonstrates the presence of his evil on earth! I know that I have fought and advocated for women's rights and equality my entire life. What can one expect? I am just a woman, so unworthy and so incapable of independent thought. How wrong I have been! I should have believed in Your wisdom, as the one and only true Leader of our country. I am now ready to admit my wrongdoing and the evil of my ways. Ohio's Legislature has just passed the most restrictive abortion law in this country. The state has outlawed abortion from the very moment that a fetal heartbeat can be detected. This is a violation of Federal Law. State after state, the GOP God and His prophets here on earth are LYING! Federal funds are NOT used to fund abortion. They have been prevented by law from use to pay for abortions. I am not ignorant. I am educated, have supported and raised my children by myself, without a husband; not by choice, but by way of death. I have been employed in the health care field my entire life and consider myself to be a highly-skilled professional. Do NOT impose GOP 'Sharia' law on me or my sisters. I will not be subservient. If I disagree with your religious views, you have NO right to impose your religious beliefs upon me... Back off! A special note to GOP male prophets: I have more knowledge about the physiology and mechanics of your male bodies and male health issues than most of you. I do not try to legislate nor would I ever try to legislate my morality or religious views upon you. The Obscenity Of Coerced Religious Conversion! Obscenity is the attempt to control a woman's right to choose. How dare anyone tell a woman that she cannot choose her own destiny, the path that her life will take or what legal medical procedures she may have performed! Abortion has been a settled legal issue in the United States since the mid-1970's. Those that disagree with the decision try to re-litigate it everyday. If you disagree with the decision, you are free to abstain from seeking an abortion. You are NOT free to impose your religious views on me. Every discussion involving pregnancy termination inevitably turns to God and the Bible and religious beliefs. It is entirely inappropriate. In a country that is supposedly not a theocracy, Christian fundamentalism is playing to a larger and larger audience. For those who are not members of the acceptable religious persuasion, this is more than worrisome. I have grown weary of Christian fundamentalists who hold women hostage. Planned Parenthood provides needed basic medical care to millions of women. Birth control, cancer screening, etc. are all women's health issues. You believe that you can hold women hostage to your archaic views that we do not deserve necessary medical treatment? 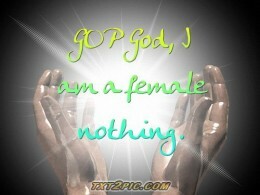 That if we do not believe in your GOP God, that we are not worthy enough to live? How dare you? It doesn't matter whether I am a Christian or not. If I am, I am probably not one that you would want to know, because I am not your property and will refuse to allow you to have authority over my body. My breasts and the breast cancer that I may not find until it is too late, are none of your business! My uterus and the birth control that I may seek are not your business! Close Planned Parenthood and I may not be able to get the birth control I need. Close Planned Parenthood and I may not be able to get the mammogram that I need! Close Planned Parenthood and I may not be able to get the pap smear that I need to preempt cervical cancer! You, the GOP prophets, are so busy legislating my body and my body parts that you fail to see that you are imposing your version of 'Christianity' upon me. How about this? Legislate something that is more near and dear to you than my body. Legislate your own body parts! Consider for a change that impotency drugs should not be covered by insurance. After all, it may just be God's will...Any insurance policy that covers those drugs should be disallowed a tax write-off. How about equal treatment under the law! Your inability to achieve or maintain an erection will not kill you, while my inability to get basic medical screenings WILL kill me.